The current version can read and write shapefiles simple GML files as well as several other vector formats via plugins. 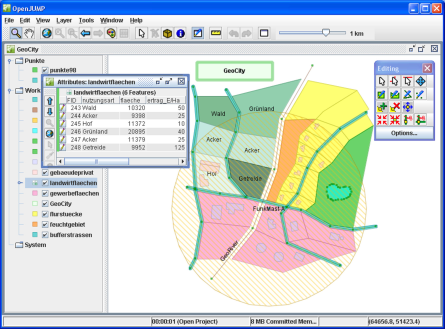 It can also read from several spatial databases and write to postgis. It has support for images and for WFS and WMS web-services. So you can use it as GIS Data Viewer. However, its particular strength is the editing of geometry and attribute data. One can style the appearance of data in OpenJUMP's map display and can export the view to SVG. A growing number of vector analysis tools for topologic analysis and overlay operations is available too. OpenJUMP 1.8 adds coordinate reference system transforms and 1.9 adds several spatial databases reading capabilities as well as a lot of bug fixes and improvements. More info in our fatcs sheet.